The International Hockey Federation (FIH) has announced the winners of its Hockey Stars awards for 2015, which sees Netherlands pair Lidewij Welten and Robert Van der Horst pick up the Player of the Year awards. Netherlands made it a hatrick of award wins as Joyce Sombroek picked up the women’s Goalkeeper of the Year for the second year in a row, while Ireland’s David Harte won the men’s Goalkeeper of the Year. The Rising Star of the Year awards went to Great Britain’s Lily Owsley and Germany’s Chrisopher Rühr, the latter picking up this award for the second time in his career. Netherlands captain Robert van der Horst, who picked up the FIH Rising Star of the Year award 10 years ago, has played exceptionally well throughout 2015. While the 31 year-old athlete provided consistently impressive performances at the Argentina Hockey World League Semi-Final and Hero Hockey World League Final, one of the highlights of his year came in August when he led his team to the EuroHockey Championships title in London, England. His compatriot, Netherlands midfielder Lidewij Welten, continued to impress for the women’s team, her attacking flair and skill wowing fans around the world. Her ability to turn matches continues to contribute to the Netherlands dominance of women’s international hockey in a year in which they won the FINTRO Hockey World League Semi-Final, finished runners up at the EuroHockey Championships and came fifth in the Argentina Hockey World League Final. Another hugely influential player in the FIH world number one ranked team is goalkeeper Joyce Sombroek. With someone as reliable as Sombroek standing as the last line of the Netherlands defence, the remainder of the team plays with huge confidence. Her dominance in the Dutch goal helped her team reach the Rio 2016 Olympic Games where they will aim to become the first women’s hockey team to win three consecutive Olympic titles. Ireland men qualified for their first ever Olympic Games since 1908 and no-one will begrudge much of the credit going to David Harte, the Green Machine’s goalkeeper and captain. Harte’s performances in the FINTRO Hockey World League Semi-Final ensured both a fighting chance for Ireland to get to Rio and his own position as Best Goalkeeper in that tournament. It was an accolade that he picked up again at the EuroHockey Championships 2015 when Ireland won a bronze medal, Ireland's first medal at a major international event. Women’s Rising Star of the Year - Great Britain and England’s Lily Owsley, emerged as a potent strike force for her teams in 2015. Picked in the first instance for her speed, Owsley has now added skill, creativity and tactical know-how to her arsenal. She played a hugely important role in England’s EuroHockey Champions victory by scoring the goal that took England to shoot-out in the final, which they went on to win. Since he first wowed the fans with his speed and skill at the Junior Hockey World Cup in 2013, taking the FIH Rising Star of the Year award that same year, Germany’s Christopher Rühr has not looked back. He was an integral part of the German team that took silver in last year’s EuroHockey Championship, was named Man of the Match in the final of the Argentina Hockey World League Semi-Final in Buenos Aires, and was also joint top scorer at that event. Players will be presented with their awards in their respective home countries over the coming weeks. Along with these awards, the FIH will also be awarding a Coach of the Year and an Umpire of the Year Award as part of Hockey Stars 2015 which will be announced tomorrow, on 27 January. LAUSANNE: The International Hockey Federation (FIH) on Tuesday named the Netherlands pair of Robert Van der Horst and Lidewij Welten as the 2015 Players of the Year in the men's and women's categories respectively, while India's Akashdeep Singh missed out on the junior player award. The Netherlands made it a hat-trick of award wins as Joyce Sombroek picked up the women's Goalkeeper of the Year for the second year in a row, while Ireland's David Harte won the men's Goalkeeper of the Year. The Rising Star of the Year awards went to Germany's Chrisopher Ruhr, who picked up this award for the second time in his career, and Great Britain's Lily Owsley. "The winners of this year's FIH Hockey Stars were decided by the combined results of an online vote that was open to everyone and a peer vote from international athletes," FIH said in a statement. Netherlands captain Robert van der Horst, who picked up the FIH Rising Star of the Year award 10 years ago, has played exceptionally well throughout 2015. While the 31 year-old defender provided consistently impressive performances at the Argentina Hockey World League (HWL) Semi-Final and Hero HWL Finals, one of the highlights of his year came in August when he led his team to the EuroHockey Championship title in London. Van der Horst beat Belgum's centre-half John-john Dohmen, German midfielder Tobias Hauke and the Australian duo of Mark Knowles and Christopher Ciriello for the award. Hauke and Knowles bagged the award for 2013 and 2014. Also, it is notable that two defenders -- Knowles and van der Horst -- have been declared the best in the last two years. Van der Horst's compatriot, midfielder Welten, continued to impress for the women's team, her attacking flair and skill wowing fans around the world. Her ability to turn matches continues to contribute to the Netherlands dominance of women's international hockey in a year in which they won the FINTRO Hockey World League Semi-Final, finished runners up at the EuroHockey Championships and came fifth in the Argentina Hockey World League Final. Another hugely influential player in the FIH world number one ranked team is goalkeeper Joyce Sombroek. With someone as reliable as Sombroek standing as the last line of the Netherlands defence, the remainder of the team plays with huge confidence. Ireland men qualified for their first ever Olympic Games since 1908 and no-one will begrudge much of the credit going to David, the Green Machine's goalkeeper and captain. Harte's performances in the FINTRO HWL Semi-Final ensured both a fighting chance for Ireland to get to Rio and his own position as Best Goalkeeper in that tournament. It was an accolade that he picked up again at the EuroHockey Championships 2015 when Ireland won a bronze medal, Ireland's first medal at a major international event. Women's Rising Star of the Year -- Great Britain and England's Lily, emerged as a potent strike force for her teams in 2015. She played a hugely important role in England's EuroHockey Champions victory by scoring the goal that took England to shoot-out in the final, which they went on to win. Since he first wowed the fans with his speed and skill at the Junior Hockey World Cup in 2013, taking the FIH Rising Star of the Year award that same year, Germany's Ruhr has not looked back. The attacking midfielder was an integral part of the German team that took silver in last year's EuroHockey Championship, was named Man of the Match in the final of the Argentina Hockey World League Semi-Final in Buenos Aires, and was also joint top scorer at that event. Ruhr beat Indian striker Akashdeep, Australian Blake Govers, and two others for the award. Akashdeep played kewy role in India winning the bronze medal in the HWL Finals in December. Along with these awards, the FIH will also be awarding a Coach of the Year and an Umpire of the Year Award as part of Hockey Stars 2015 which will be announced on Wednesday. A trio of the world’s very best players are bound for the Euro Hockey League KO16 in Amsterdam at Easter with FIH recognition under their belt following the announcement of the Hockey Stars earlier today. Oranje Zwart’s Rob van der Horst – the Dutch captain – added the world’s best player to the Rising Star title he won 10 years ago following a brilliant year, leading his side to Olympic qualification as well as gold in the EuroHockey Championships in London. Kampong’s David Harte became the first Irish player ever to win an FIH award following an incredible year for his national team. He was named Goalkeeper of the Year after a campaign that saw his side qualify for the Olympic Games for the first time since 1908. He won goalkeeper of the tournament at World League Round 2 in San Diego, Round 3 in Antwerp and at the European Championships when Ireland won their first elite level medal, a bronze in London. The men’s FIH Rising Star of the Year award went to Germany’s Christopher Rühr who will grace the KO16 in Rot Weiss Koln colours. The lightning quick striker was an integral part of the German team that took silver in last year’s EuroHockey Championship, was named Man of the Match in the final of the Argentina Hockey World League Semi-Final in Buenos Aires, and was also joint top scorer at that event. On the women’s side, Lidewij Welten won the top award while Joyce Sombroek got the goalkeeper award. Lily Owsley took the Rising Star gong. Lily Owsley, the England and Great Britain forward has been named as the FIH’s Rising Star of the Year for 2015. The award which replaced the FIH World Young Player of the Year prize is decided by the combined results of an online vote and a peer vote from international athletes. The University of Birmingham star who made her international debut back in June 2013 held off stiff competition from Xan De Waard (Netherlands), Charlotte Stapenhorst (Germany), Rose Keddell (New Zealand), and Maria Verschoor (Netherlands) to take the prize. It has been a successful year for Owsley and her teammates with the 21-year-old playing a pivotal role in Great Britain’s unbeaten run at the World League Semi-Finals in Valencia, a competition which Danny Kerry’s side won and in the process, secured Olympic Qualification. Owsley netted the winning goal in the semi-final against Germany to help seal their place in Rio. A fast, skilful, brave and hard-working player, the No26, who has 74 England and GB combined caps to her name has produced some scintillating hockey this past year. Her crowning moment was at the Unibet EuroHockey Championships. In front of a home crowd, Owsley and her England team mates put together an unbeaten run to the final where she scored a late equaliser against the Netherlands to take the match to a shootout, which England subsequently won. Owsley and her team mates will be looking to repeat the trick when Lee Valley Hockey and Tennis Centre hosts the Champions Trophy this June, just weeks ahead of the Rio Olympics. “Individually this is the biggest award I could have won, but really I’m lucky to win it and lucky to have so many fantastic team mates around me. I couldn’t do anything without them making me look good! Team mate Alex Danson was nominated in the FIH World Player of the Year category which was won by Lidewij Welten of the Netherlands whilst Maddie Hinch was nominated in the FIH Goalkeeper of the Year category which was taken by Joyce Sombroek, also of the Netherlands. In the men’s categories, Netherlands captain Robert Van der Horst picked up the Player of the Year award while Ireland’s David Harte won the men’s Goalkeeper of the Year. The Rising Star of the Year awards went to Germany’s Christopher Rühr, picking up this award for the second time in his career. 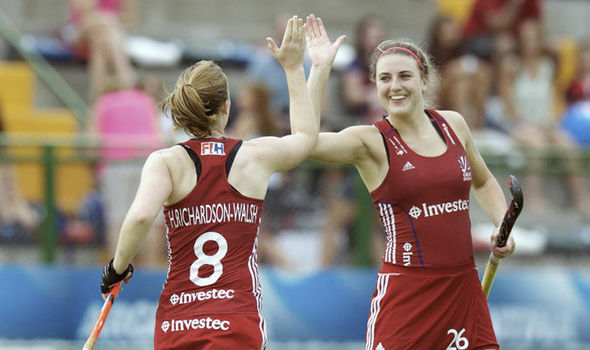 LILY OWSLEY, the 21-year-old Great Britain and England striker, has been named as the FIH’s Rising Star of 2015. The University of Birmingham star, who made her international debut in 2013 and now has 74 combined GB and England caps, played a key role In Great Britain’s title winning run at the World League/Olympic Qualifier in Valencia where she scored the winning goal in the semi-final win over Germany to clinch GB’S Rio Olympics place. But her 2015 highlight came at the Unibet EuroHockey Championship in the Olympic Park when she scored a late equaliser in the final against the Netherlands to take the match to a shootout, which England won for their first title since 1991. A week ago Owsley was runner-up in the UK Player of the Year awards at the Hockey Writers’ Awards presentations. The FIH awards are based on the results of an online vote and a peer vote from international players. Owsley is the first Englishwoman to win this category and the first English athlete to gain an FIH player award since Ashley Jackson’s success in the men’s Rising Star category in 2009. Alex Danson was nominated in the FIH World Player of the Year category while Maddie Hinch was a nominee for the Goalkeeper of the Year award. 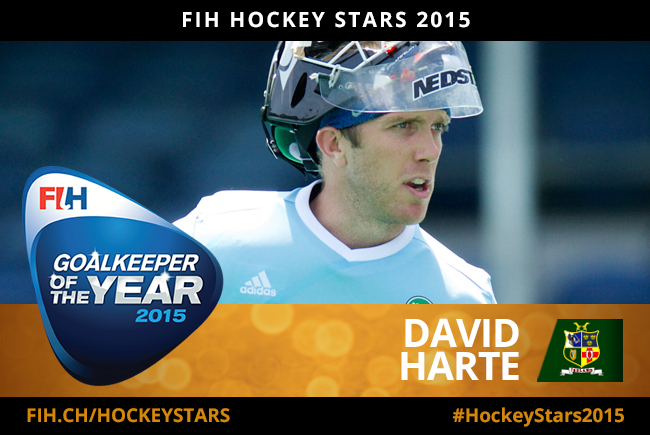 Hockey Ireland is delighted to announce that David Harte has been named as FIH Goalkeeper of the Year 2015! Harte was nominated for the prestigious award alongside Jaap Stockmann, David Carter, Andrew Charter and Nicolas Jacobi, some of the top Goalkeepers in the world. Harte, who is currently playing for Dabang Mumbai in the Hockey India League, won Goalkeeper of the Tournament for every international competition he competed in with the Green Machine (World League 2, World League 3 and Eurohockey Championships) and was chosen as ‘Sporter of the Year’ at his club SV Kampong in the Netherlands. Speaking about the much-deserved award, Harte said "I'm still in shock if I'm honest. To win the FIH Goalkeeper of the Year is such an incredible honour, all the more so when you consider that so many people had to take the time to vote, to whom I'm very grateful. While it is recognised as an individual award, I certainly know I would never have envisioned reaching such a level without my coaches in school and at underage level, my club Kampong in my second home Utrecht, and of course my Irish team mates, especially my twin brother Conor, and incredible coaching staff. Not to forget of course my family and friends who have been with me from the start, through the highs and the lows, thankfully there have been plenty more highs than lows recently. 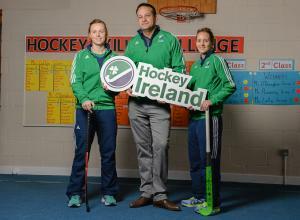 It has been some year both for myself and Irish hockey". A big thank you to everyone who took the time to vote for both David and Shane O'Donoghue for the FIH All Star Awards. Ranchi: Defending Champions Ranchi Rays continued with their winning ways defeating Delhi Waveriders 2-1 in the ninth match of the 4th edition of the Coal India Hockey India League today. The hosts registered their second win today and first on their home ground, the Astro Turf Hockey stadium, Ranchi. Ranchi Rays with this win have 11 points to their kitty and now share the top spot in the league points table with Delhi Waveriders, Kalinga Lancers and Jaypee Punjab Warriors. undefined The first quarter of the match began on the defensive note with both the teams playing a very careful game. A lot of the game was played in the midfield where players showcased their ball play skills to a great extent. It was only in the second quarter when the Delhi Waveriders known for their attacking game started pressing hard on the Defending Champions. Ranchi Rays known for a very strong defensive line showed their class by denying any opportunities for conversion to the visitors. However the Delhi Waveriders were successful in converting a penalty corner in their favour in the 27th minute through Rupinder Pal Singh giving the visitors a hard fought lead of 1-0. Ranchi Rays changed their game and pressed harder on the visitors thereafter. Their efforts saw result when they equalised in the 29th minute through a penalty corner conversion from Captain Ashley Jackson. The first half came to an end with both the sides levelled at 1-1.
undefined The third quarter began with Ranchi Rays attacking from the very first moment and their efforts showed results when Ashley Jackson scored for the second time through a penalty corner in the 31st minute, giving the home team and defending champions a 2-1 lead in the game. The match there after saw many efforts from both the teams but none of the sides could convert any chances that came their way. The match ended with Ranchi rays winning 2-1 their first match on home turf against Delhi Waveriders. The next match of the 4th Coal India Hockey India League will be played between Ranchi Rays and Kalinga Lancers at the Astro Turf Hockey Stadium, Ranchi on 28th January, 2016. Ashley Jackson took his drag-flicking ability to a new high converting two penalty corners to give defending champion Ranchi Rays its second successive win when it downed Delhi Waveriders 2-1 in the Coal India HIL at the Morhabadi Astroturf Stadium here on Tuesday. Egged on by a raucous holiday crowd, the home side doubled the Republic Day fervour erasing a goal’s deficit to make a spectacular comeback. Rays had beaten Uttar Pradesh Warriors (4-2) in Lucknow in the previous outing to pick up their first win. Looking to extend their successful ‘away’ run, following two emphatic wins against Jaypee Punjab Warriors and Uttar Pradesh, the Wizards took the lead early in the second quarter. The host created and missed some early opportunities in both the first and the second quarters when Imran Khan’s goalmouth pass went abegging while captain Jackson pushed his first penalty-corner attempt straight into the DWR goalkeeper Devon Manchester’s path. Rupinderpal Singh found the net off a mighty flick to give DWR the lead much against the run of play. The host was attacking in hordes and the visitor went defensive pushing more men around the goal. The Rays enjoyed the initial leverage and tried to find a field goal and make the most of the new regulation that doubles the goal count if it comes off the normal process. Rupinderpal’s fine effort changed the equation all of a sudden forcing the home side to scamper into a damage control situation. Jackson, the host’s game-maker, got the Rays back in the game by the end of the second quarter. He helped it to successive penalty-corners of which he converted one to restore parity in the 29th minute. Encouraged by the late equaliser, the Rays started on a strong note after the change of ends and found the winner in the very first minute of the third quarter. Jackson produced a variation to his previous successful effort and put the ball into the net beating the onrushing DWR defenders. The host held on to the slender lead for the remainder of the action and thwarted at least two good efforts from DWR. The first one came off Rupinderpal whose drag-flick in the 33rd minute almost went home after hitting the Rays’ goalkeeper Lovell Tyler but for an alert Barry Middleton clearing it off the line. The win helped Ranchi Rays join Kalinga Lancers, Punjab Warriors and DWR tied at 11 points each in the current league standings. RANCHI: After the 10-2 treat in the Kalinga Lancers-UP Wizards match on Monday, the Ranchi Rays-Delhi Waveriders clash at the Astro Turf Stadium here on Tuesday proved to be a low-scoring affair. But the Rays were not complaining as they registered a 2-1 win in their first home match of the season, surviving a wave of attacks by the Waveriders in the dying minutes. Egged on by the full-capacity crowd on Republic Day, the hosts came from behind and rode two strikes from skipper Ashley Jackson to join the Kalinga Lancers and Punjab Warriors on top with 11 points with their second win in three matches. .
All three goals in the match came from penalty corners as the teams found it hard to get a breakthrough field goal. The match began in high tempo with the home side looking for a quick lead and the visitors staying content with defending. Ranchi kept pushing ahead from both flanks with skipper Jackson creating moves from the middle. But it was the Waveriders who created the first real chance with the first penalty corner of the match. First-charger Manpreet Singh deflected the Rupinder drag-flick to avert danger for the Rays but the midfielder had to soon leave field due to injury. The real action began in the second half with both teams pushing hard. Rays won their first penalty corner from a creative move by Man of the Match Barry Middleton inside the circle. But it was Waveriders who took the lead through a penalty corner in the 27th minute. When the Canadian men’s field hockey team learned it was potentially traveling to Cape Town, South Africa to start the year, there’s little surprise the trip was unanimously welcomed. Spending January in the South African sun instead of in Vancouver’s infamous rain and cold was an easy sell. “It’s been pretty upbeat and guys are happy to be out in the sunshine and not in the freezing rain,” says veteran goalkeeper David Carter. But the first tour of the year is not a vacation by any means. With the Olympic Games just over six months away, the trip to South Africa officially begins Canada’s countdown to the Games. The team has been in Cape Town since the second week of January in the first stop of a busy year, which culminates at the Olympics in Brazil in August. With seven games already played (five friendlies and two official test matches) in less than two weeks, there has been no time wasted. In fact, on many game days, the evening match has been the second of two field times in the day. The two-a-days highlight the commitment the Canadians have to improving in the months leading up to Rio. Of the 12 teams qualified for the 2016 Olympics, Canada (World No. 14) is ranked the second lowest after host Brazil (No. 32). However, having recently beat teams like New Zealand (No. 8), and good showings against Ireland (No.12), Argentina (No.6), and the Netherlands (No.2), the Canadians know the more field time they get, the better off they’ll be come August. “We don’t get to play a ton of meaningful games because we have to travel so far to get them,” says veteran forward Philip Wright, who played in his 150th international match when Canada faced Ireland on January 21st. To be able to take advantage of all the field time, the team has been relying on support staff for seamless rest and recovery. Team Manager Celia Plottel and nutritionist Sandra Millward have been taking care of meals, and the rest of Canada’s integrated support team has been ensuring the players are ready to go for each session. The Canadians play a set of three friendly matches against Belgium (World No.4) beginning on Wednesday at 3:00pm local South African time (5:00am PT/8:00am ET). KARACHI: Pakistan Whites hockey team for the coming 12th South Asian Games will be announced on Wednesday. The SA Games take place in the Indian cities of Guwahati and Shillong from Feb 5 to 16. “The team will be picked on merit and players who failed to get selected in the seniors and juniors outfits will be given a chance,” the Pakistan Hockey Federation (PHF) secretary ex-Olympian Shahbaz Ahmed told reporters at the end of one-day trials that took place at the Hockey Club of Pakistan Stadium on Tuesday. He said no compromise will be made on talent but at the same time hinted that four to five senior players will be included to raise a balanced team. To a question, he dispelled the impression that there were some differences among chief selector Abdul Rashid junior and co-selectors Saeed Khan and Qasim Khan after they failed to arrive for the trials. “Rashid missed to catch the morning flight but was due to reach here by tonight,” the secretary added. About Saeed, the secretary added that the former had gone to Paris on a private visit. Asked about schedule of PHF hierarchy’s meeting with Prime Minister Mian Nawaz Khan, who is also patron-in-chief of the PHF, he said the latter has a hectic schedule these days and due to that the PHF will wait for sometime before getting in touch with the PM secretariat for a meeting. Answering yet another question he said efforts would be made to make it mandatory for the departments to raise hockey teams. Shahbaz went on to disclose that the Australian Hockey Federation president will visit Islamabad in April and subsequently Pakistan will compete in a four-nation tournament. At the outset, the trials were held in three sessions in which 40 probables, who are attending the camp, participated. Besides the PHF secretary, the trials were watched by selectors Waseem Feroz and Farhat Khan. KUALA LUMPUR: There’s no better feeling than upsetting the odds. Fresh from a stunning 1-0 win over last year’s runners-up Universiti Kuala Lumpur (UniKL) in the TNB Malaysian Junior Hockey League (MJHL) match last week, Politeknik are already eyeing a top-four finish in the 10-team Division One – and qualification to the knockout stage. The win over UniKL sees Politeknik moving up to third in the standings, with seven points from two wins, a draw and a loss. Politeknik, who were promoted to Division One last season for winning the Division Two title in 2014, finished sixth last year. This time, with five matches remaining, they have set their sights higher. Double champions Tunku Mahkota Ismail Sports School (SSTMI)-Thunderbolt top the standings with a perfect 12 points from four matches, followed by Pahang Sport School-MSP-Thunderbolt in second place with nine points from three wins. Politeknik team manager Mohd Rafi Solaiman said that the win over UniKL had boosted his players’ confidence and they are raring to take on Olak Tigers at the Tun Razak Stadium in Jalan Duta on Wednesday. “Our aim now is to finish among top four and qualify for the knockout stage,” said Rafi, whose team will have to miss out on the services of defender Muhammad Aiman Zahari (ankle injury). But it shouldn’t matter too much against the struggling former champions Olak, who only have three points from a win and three losses. AS pupils around South Africa settle into their school routine, KwaZulu-Natal’s first team hockey girls begin to train for this year’s SPAR KZN School Girls’ Hockey Challenge which kicks off in February. There are 10 host schools and Hermannsburg is one of them. Close on 80 first teams play in the annual tournament with the finals held in July in Durban. Joining forces, this year Varsity College have come on-board offering one hockey player a bursary to their institution. Kicking off, St Dominics Academy hosts the Northern KZN Regional in Newcastle on 27 February. Pietermaritzburg then hosts the second and third regional on 12 March with Pietermaritzburg Girls’ High hosting the PMB Central Regional and St Anne’s hosting the PMB North Regional. Maris Stella hosts the DBN Central Regional on 13 March. The fifth tournament, the DBN South Regional, is hosted by Kingsway High on 9 April. Danville Girls’ High runs the DBN North Regional on 10 April. St Patricks College in Kokstad welcomes teams for the Southern KZN Regional on 16 April. Grantleigh in Richards Bay hosts the Northern Coastal Regional on 7 May. Hermannsburg will host the Umvoti, uThukela and Umzinyathi Regional on 14 May. Nobody can deny 2015 was a record breaking year for hockey in Ireland; Olympic Qualification secured, along with a European Bronze medal for the senior men, matched with plenty of previously unclaimed scalps for the young women’s squad. Both teams are already embedded in their 2016 programmes with trips to South Africa and Valencia in the opening weeks of the New Year. But away from the pitch many of our international stars are equally busy in their roles as ‘Champions’ as part of Hockey Ireland’s grassroots initiatives. One such programme is the Hockey Skills Challenge; a skills circuit with an opportunity for everyone to earn a Certificate of Hockey Skill. Gold, Silver and Bronze levels ensure anyone, regardless of their hockey ability or knowledge, can undertake the Challenge on any surface. 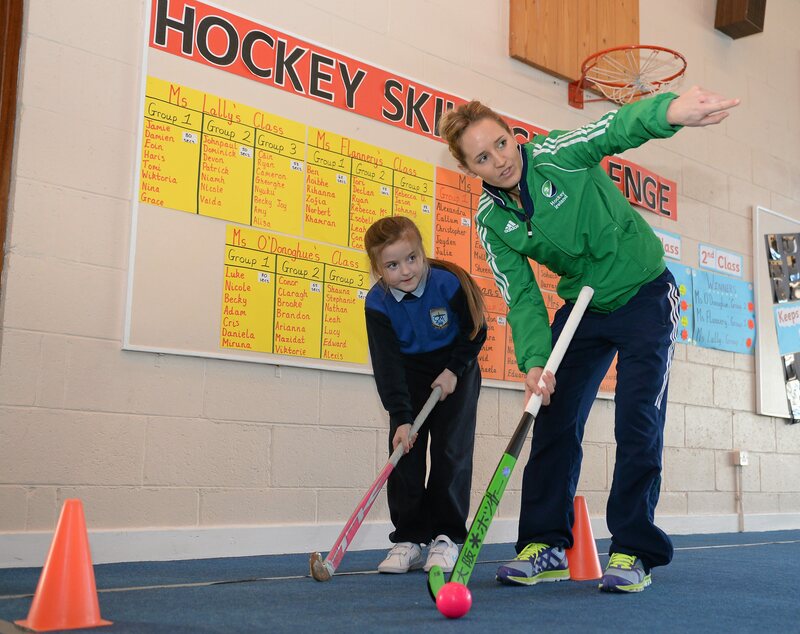 Supported by the Irish Sport Council’s Women In Sport, the HSE and Healthy Ireland, the Hockey Skills Challenge is fun, rewarding and free, and over 6,500 children have already signed up for the initiative! 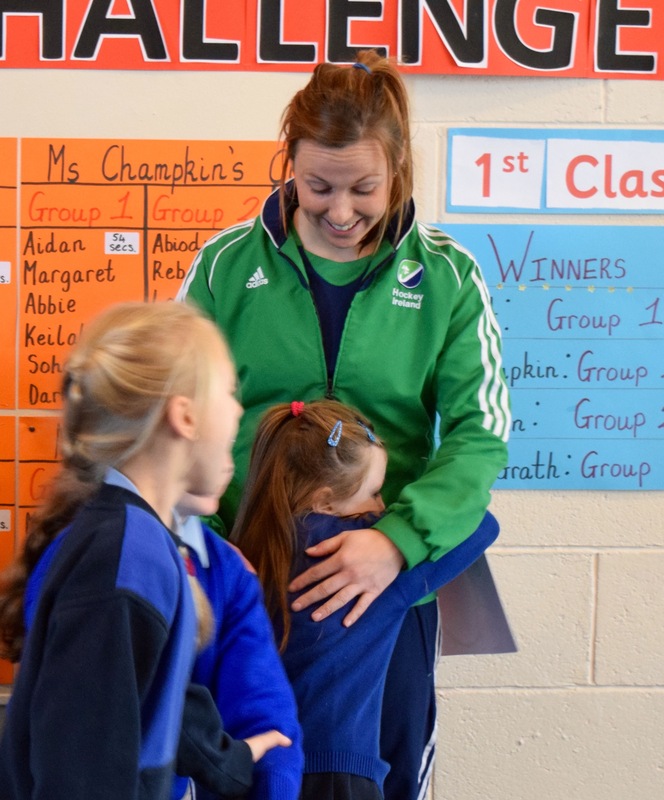 Scoil Mhuire Junior in Blakestown was one of the lucky schools to receive a visit from 2 members of the Irish women’s senior team on January 22nd. Nicci Daly, with 122 caps to her name, and Megan Frazer, Captain of the squad, were joined by Minister for Health Leo Varadkar to undertake the Challenge. 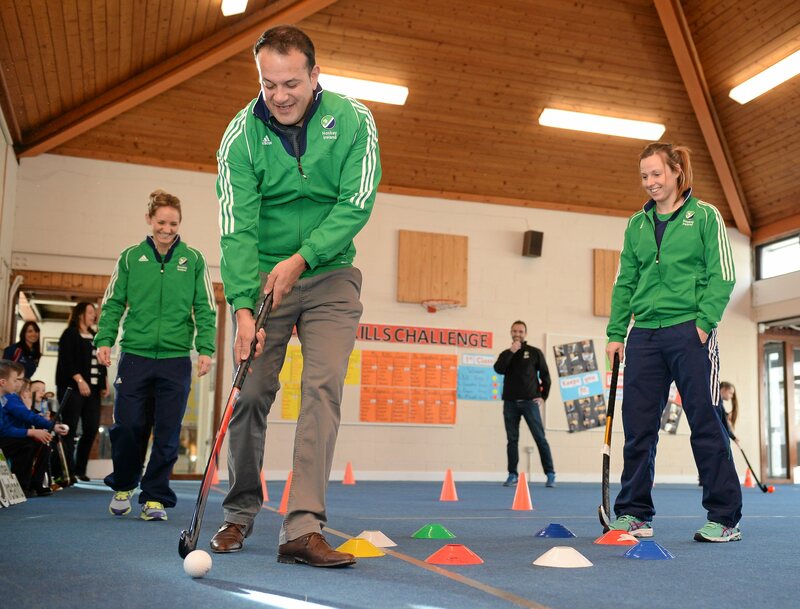 Over 150 primary school children had completed the Hockey Skills Challenge at Scoil Mhuire, and Frazer and Daly were on hand to share their knowledge and experience, as well as Minister Varadkar who ably showed his hockey skills around the circuit. Megan Frazer was quick to point out the benefits of the programme “It’s great to have a programme that can be undertaken even if a school doesn’t have a previous history of hockey or a hockey pitch. The different Gold, Silver and Bronze levels mean that both experienced hockey players or a child completely new to hockey can complete the Challenge. It’s about sparking an interest in the sport and giving children a taste of what it offers; everyone has to start somewhere”. Nicci Daly also hailed the chance for the international players to share their skills and experience “It highlights that from a young age kids can really be inspired by people playing at the top level. They want to have the same stick as you, and play in the same position as you, and, most importantly, learn. The Hockey Skills Challenge is a great way to get kids involved in hockey because no matter what their level of play is, every child gets to feel a sense of achievement by earning either the bronze, silver or gold certificate”. New South Wales and Victoria have secured the 2016 under 13 indoor carnival titles in Wollongong over the weekend. After almost a month’s worth of non-stop indoor action, the Festival of Hockey drew to a close after the final matches of the U13 boys’ and girls’ divisions. In the boys gold medal final, the host state New South Wales defeated Victoria 9-3 on the final siren. New South Wales cruised through the tournament, holding top spot on the standings after successfully winning all of their competitive matches. It was a busy first half for the hosts in their attacking circle, as they comfortably lead 5-2 coming into the halftime break. A double from Jake Lambeth was coupled with strikes from teammates Jake McCann, Isaac McGregor and Sebastian Rollings. Victoria also successfully hit target during the match with a hat-trick from Ben Allen. Within a 20 minute stint in the second half, New South Wales’ Toby Dreyer, Rory Hanrahan, Elliott Speed and Jake McCann extended the lead 9-3 to claim the prestigious national title. In the classification matches, the Queensland Shots finished atop of the Queensland Spurs 2-1, with goals from captain Oliver Roberts and Tyler Newell. Lachlan Plant’s field goal was enough to put Queensland Spurs on the board but not enough to steal the victory from their states second team. Meanwhile, the U13 girls’ gold medal final went into a shoot-out after Queensland Fire and Victoria finished on par 2-2. Victoria’s captain Emily Hamilton-Smith opened the final with an on-target penalty corner two minutes after the starting whistle, however, the score became deadlocked when Queensland’s Letitia Paix found the back of the net at the 18th minute mark. Queenslander Rowlande Williams and Victorian Eugenie Richard both hit target for their home states in the second half of the match, sending the final into a deciding shoot-out. Victoria came out of the shoot-out 2-1 victors, taking top spot on the final standings and the 2016 crown home. New South Wales defeated Queensland Flare 2-1 in the classification match. Emily Thompson and Lara Watts scored for the host state, while Jessica Moffat hit target for the team in maroon. Black Sticks defender Sam Charlton is set to help the fight against obesity and type 2 diabetes as an ambassador for FABruary. FABruary is a month which puts the spotlight on nutrition, exercise and lifestyle with the aim to prompt healthier choices. Charlton will champion the cause alongside other high profile names including current and former NZ Warriors Manu Vatuvei, Ali Lauitiiti, Jerome Ropati, Jerry Seuseu, Clinton Toopi and Mai FM host Nickson Clark. Charlton, who has a tertiary qualification in nutrition, said it’s hugely important for Kiwis to be conscious of what they are putting into their bodies. “Making healthier choices in what we are eating and drinking, along with being active can make a huge difference on rates of obesity and especially the prevalence of type 2 diabetes,” she said. The FABruary ambassadors will converge on Victoria Park from 11am-1pm this Friday to take up their healthier lifestyle pledges. COLORADO SPRINGS, Colo. - USA Field Hockey is pleased to welcome two new names to the organization. Adam Andrasko will work out of the national office in Colorado Springs, Colo. and Sally Goggin will work remotely in Chicago, Ill. In this newly created role, Andrasko joins USA Field Hockey after serving 6 years with the United States Olympic Committee (USOC). He started as an intern in the Athlete Services and Program department where he excelled to the USOC Operations Coordinator at the Olympic Training Center in Lake Placid, N.Y. and lastly the Training Sites and Community Partnerships Department Coordinator and Manager at the Colorado Springs, Colo. location. "Adam joined USA Field Hockey in the new year as our Member Services Director and will lead our membership, marketing, commercial and communications team, and donor relations," said Simon Hoskins, USA Field Hockey Executive Director. "Adam joins us from the United States Olympic Committee and brings a wealth of experience of best practice across all sports within the Olympic movement. His energy and leadership will ensure we deliver on the core strand of our mission, to serve our members." Andrasko is a graduate of Lock Haven University in Pennsylvania where he earned a Bachelor's degree in Sport Administration and was also a four-year letter receipt and captain of the varsity football team. He interned for the Pennsylvania State Athletic Conference and also served as the graduate assistant for the United States Collegiate Athletic Association. Upon graduating, he continued his education and earned an Education Master's degree in Sport Management from Old Dominion University in Norfolk, Va.
“I attended two universities with solid field hockey programs," said Andrasko. "That combined with my passion for team sports has attracted me to USA Field Hockey. During my 6 years at the USOC I have learned a lot about how National Governing Bodies operate and this position will afford me the opportunity to put what I have learned into practice." Originally from Hawk Run, Pa. in central Pennsylvania, Andrasko resides in Colorado Springs, Colo. with his fiancé Rio and dog Cooper. He is active in the community and serves on three local non-profit boards, founded the USOC's Emerging Leaders in Sport organization and officiates high school wrestling. He will work out of the national office. Goggin is a native of Illinois were she started playing field hockey at Deerfield High School. She went on to play at Dartmouth College where she received All Ivy League First-Team Honors and was the team captain. After college, Goggin went on to work for Leo Burnett in Media and Client Services for Fortune 500 companies. More recently, she has been a successful entrepreneur and helped bring field hockey to Glen Ellyn, Ill. and Glenbard West High School. "We are delighted that Sally Goggin has joined USA Field Hockey as our National Development Director," added Hoskins. "Sally will be responsible for the strand of our mission of grow the game. Sally brings infectious enthusiasm for field hockey, having been involved in the sport as a player, student athlete, coach, parent and grassroots organizer. With a pedigree in the corporate world of sales and marketing, and a successful entrepreneurial career Sally has the drive and skill set to build on our sports development programming to grow the game." Goggin is passionate about developing opportunities for kids of all ages to experience the great game of field hockey as players, coaches, umpires and fans. Both Adam and Sally will be at the Presidents' Day Showcase so please welcome them to USA Field Hockey by stopping by the USA Field Hockey information tent.